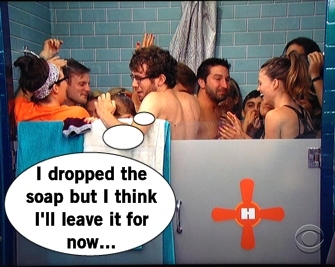 Vanessa is excited not only to be co-HOH with Austin, but to have learned the full Twin Twist truth. Along with Shelli, Clay, and Austin, they form the "Sixth Sense" alliance which will increase to a 6 member alliance if/when Julia enters at week 5. 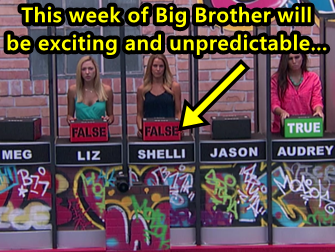 They just need to avoid Liz getting evicted, but her target isn't as big as expected. Everyone squeals in delight to "meet" Julia officially, make their grand game plans, and train the twins how to be more like each other. Eat more, work out less, cover your birthmarks- basic crap any girl let alone a twin should know from reading a Sweet Valley High book. Austin is just relieved to understand why one twin flirts and the other blows him off. 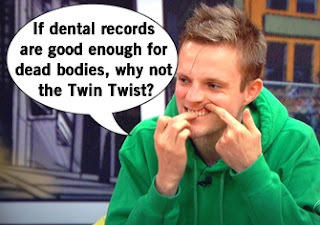 Meanwhile the rest of the house is still in the speculation zone, with Johnny Mac having the best evidence: one twin has a crown on her #9 tooth, the other doesn't. Dental records, man. Dental records. Once again the house assumes the target will be Audrey, but shocker: she's not. Vanessa and Austin would like to backdoor super social Jeff or get rid of James or Jason as a back-up scenario. If Audrey's still in the house, she'll remain the house's main target for weeks to come. You'd think this change of target would be the most shocking news in the house, but it's not. The biggest shock this week is Austin's admission of being a diehard Clay Aiken fan AKA Claymate. Ok back to nominations, guess who's going to be a pawn again? Johnny Mac! To make it alright with him, the HOHs offer him weeks of safety. 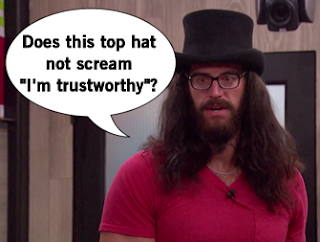 In his stupid Judas top hat, Austin nominates Meg and Jason, who are fuming. Vanessa nominates Johnny Mac and James, who takes it in stride. The backyard is transformed in a huge foam party with actual other human beings! Society! Beneath the suds is a maze, and the Battle of the Block competitors have to find a person in the foamy maze wearing the same article of clothing they pulled from a big pile. Everyone suffocates through the dirty party water, which makes it easy for Johnny Mac to throw the competition as he avoids inhaling foam. Not to mention James is just plain terrible at finding the matching patterns in the pile. Meg and Jason are able to win the Battle of the Block, which means James and Johnny Mac remain on the block. It's all good for now, but eventually Johnny Mac will get mad as hell and not take it. But that's down the line apparently. Audrey gets picked for the veto competition, enraging all of the house who haven't figured out she isn't the target yet. 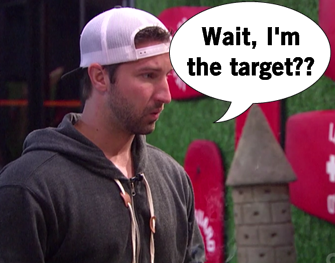 Vanessa's target has switched to James, so Audrey winning veto is the perfect scenario to keep nominations the same as well as be the ultimate cop-out reason for why Vanessa didn't nominate her. 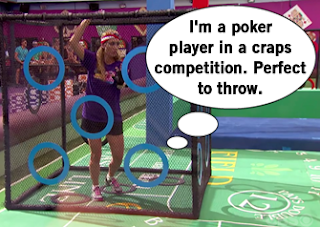 The veto competition "Gronk and Roll" is to get in the giant cubes from last year, now themed as Vegas dice, and roll their cube until they land with the pre-determined number on top of the dice. Vanessa throws round one to Audrey, but nominee John knocks Audrey out round two, so that kills that plan. The final round is John versus Austin, who has implemented his frog hopping strategy. 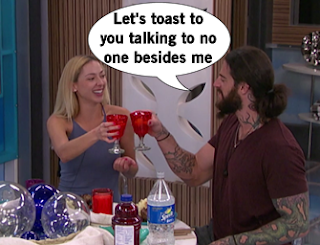 Austin channeled his inner Judas and threw the competition, though he denies it to an unbelieving Vanessa, so that Vanessa's plans would have to shift back to his own plan (Jeff). It's all worth it for Johnny Mac to be reunite with the Veto and turn the Veto into a talking character who does "Whatever the hell I want." The Gronk BB Takeover continues in the corniest way possible: forced fun. Any time Gronk calls the house to party they must oblige or they become a Have Not. The techno music pumps as the house is forced to shower together, squeeze into the tiny pool together, and just dance a lot. Kudos to John, the star of it all, who explains sometimes you end up in a shower with 14 other people while wearing a hoodie. Now THAT sounds like how Gronk would party. What starts as fun slowly grows to resentful misery. Not just for the houseguests, but for viewers enduring these parties. Seriously Gronk, such a brand killer. One "lucky" houseguest wins a cruise with Captain Gronk come February and I hope it's not one of those cruises where the poop doesn't get clogged up. Only the nominees and HOHs can participate and chug down their Solo cup to victory. Meg wins the cruise so maybe by then she'll know who or care who Gronk is. Now needing to find a replacement, Vanessa tells Jeff that given who Audrey is and her cause that she can't nominate her. Jeff can't believe that Vanessa would target James over an easy target like Audrey, unaware he's the target until Jason points out that Austin is a terrible liar. With Jeff's lies stacking up, this gives Vanessa the perfect reasoning to nominate him. Austin helps stir the pot, claiming Jeff wanted to target him, then brings Vanessa is to finish Jeff off and make him the target. 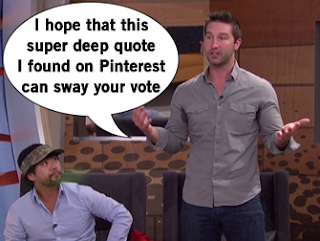 Jeff takes over John's nomination seat and seems the Amazing Race alum will likely head out the door on eviction night. Jeff's none too happy to be backdoored, pissed at Vanessa's decision. James is happy because he's not the target, but also would be OK leaving to pursue hot chicks in the real world. Jeff isn't just accepting Vanessa's nomination, working hard and campaigning to accumulate the votes to stay. Except Jeff is really dense about who to trust and not trust, specifically Austin who is the biggest betrayer of Jeff's trust by far. Jeff tries to put on the dramatics to campaign, attempting to play at the emotions of his fellow houseguests. Dude, get a clue. However the show plays up the alledged "love triangle" between Liz, Austin, and Jeff and it's so pathetic. Austin has a "strong connection" with Liz which is maybe a one sided thing, but Liz also kind of likes it? But Jeff also has a cuddle crush on Liz, and she likes to flirt and manipulate Jeff despite Julia urging her to stay away. Austin gets super jealous, running to ice cream in the fridge and venting in the HOH room about Liz and Jeff talking under the covers. Uh, don't you have a girlfriend back home? 90s week in the Big Brother house begins with an HOH competition called "Bustin' Moves." The houseguests have to watch a performance by a sadly assembled dance crew of 90s dances and then answer true/false questions. It's got some sweet graffiti that says "BOOYA", "GNARLY", and other totally 90s words. The dancers are dressed to the 90s extreme like Hammer pants and overalls, but the houseguests have to pay attention to lots of details to win this trivia. Liz and Shelli are the only two to answer question three correctly, making them the co-HOHs. The rest of the episode is time-filler questions to which no answers matter. But let's pray the 90s week BB Takeover might do something interesting in what we expect will be a boring week.